Are you looking for a leg up on college applications? Do you want to hone your writing skills? Do you need some inspiration to write and want to get feedback from peers and published writers? Do you want to have a pre-college experience at a big-time university? 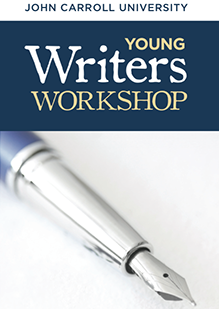 The John Carroll Young Writers Workshop is looking for students like you! Join us for our Summer 2019 Workshop, taking place on July 22-26, 2019! Questions? Email program coordinator Dr. Philip Metres at pmetres@jcu.edu or call 216-556-1101.